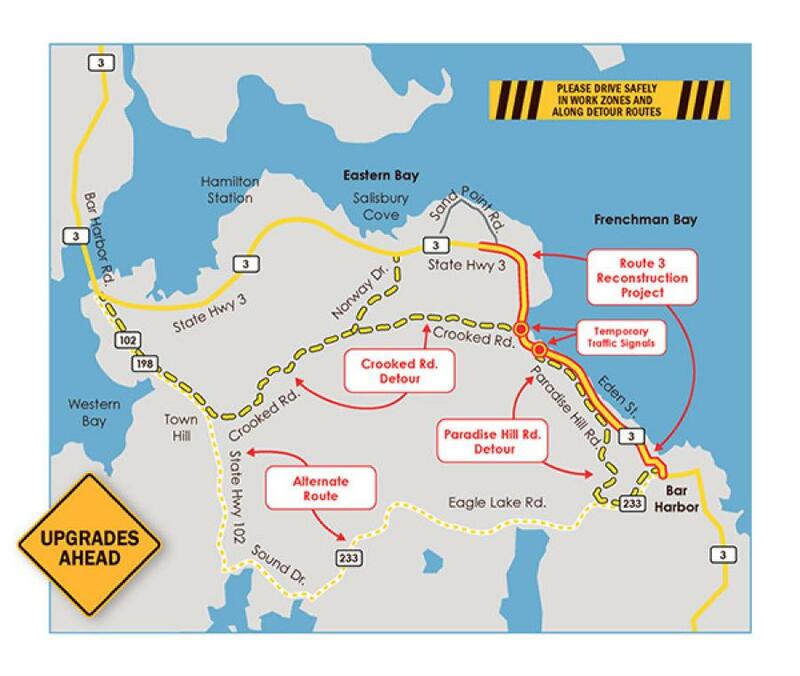 MaineDOT announces that its contractors wrapped up Phase One of the reconstruction of Route 3 in Bar Harbor by Thanksgiving Day. The project kicked off in early spring and continued throughout the busy summer season. Work began 0.57 mi. west of Sand Point Road and has proceeded southward to Crooked Road. During this time, northbound traffic was detoured to Crooked Road except for periods when two-way traffic could be maintained on Route 3. Access to homes and businesses along Route 3 has been maintained throughout the reconstruction. • All new drainage and drainage structures completed from Pirates Cove to Crooked Road. • Roadway reconstruction and new pavement with 4-ft. wide paved shoulders for approximately 2 mi. of Route 3 from just west of Sand Point Road to Crooked Road. • New sidewalks from the location of Gallagher's Travels Motel & Cabins to Crooked Road. • Obstructions have been removed and the water view has been improved from Lookout Point Road to Crooked Road. • New rock walls have been constructed on the downhill approach to Crooked Road, enhancing the appearance of the entrance to Bar Harbor. Looking ahead, winter work will include additional site drainage construction and water line work plus, weather permitting, larger drainage structures near West Street and near College of the Atlantic. Next spring, the reconstruction of Route 3 will proceed below Crooked Road into Bar Harbor to the end point at the intersection of Routes 3 and 233. The start date will be determined according to weather, and outbound traffic will be detoured to Paradise Hill Road. When completed in early 2019, the Reconstruction of Route 3 will result in an improved roadway, paved shoulders for bicyclists and pedestrians, new sidewalks, upgrades of existing sidewalks to ADA standards, safer crossings with electronic crossing signs, a new multi-use path along part of the roadway, improved drainage and improvements to the intersection at Mt. Desert Street and West Street. For more information, visit mainedot.gov.